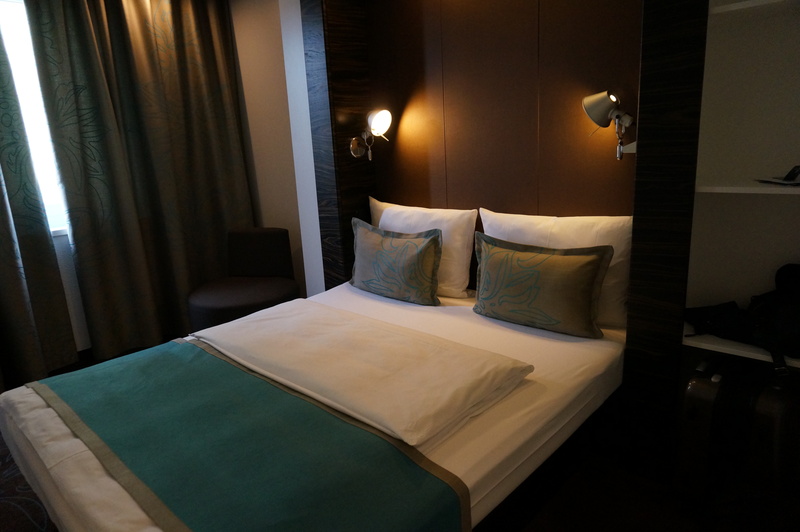 I love staying in a nice hotel, and when I opened the door to my room at Motel One in Munich, I knew right away I was going to enjoy the time I spent there. First impressions matter, and I was greeted by mood lighting, mellow “spa” music and a salt water aquarium playing on the flat screen television. Motel One is a “budget design” chain based in Munich, with 42 properties in Germany, 4 in Austria, 2 in the UK, and 1 in Brussels. The hotels are typically centrally located, or near major transportation lines, so you can stay close to the action in one of your favorite European cities affordably and with style. The hotel is walking distance to the Ostbahnhof, with tram and bus lines a few steps away, departing to the city center every 5 minutes. On a nice day, it’s an enjoyable 45 minute walk through neighborhoods to reach the city center. Amenities in the room included a desk, and free wi-fi, which is important for business travelers and bloggers alike. Bathrooms are equipped with the basics – a shower, hair dryer, towels, and a bottle of their shower gel/hand soap. The hotel group consulted a Danish interior design firm to create the minimalist, modern design motif in a soothing palette of brown and tan with accents of cool turquoise. The result is tasteful, visually appealing and much nicer than you would expect in a room with a nightly rate as low as 69 Euro. I think I just found my favorite European hotel chain – a place where I can indulge in my love for good design, without blowing my budget.